Starring: JENNIFER CONNELLY, DARIA NICOLODI, DALILA di LAZZARO, PATORICK BAUCHAU, DONALD PLEASANCE, FIORE ARGENTO and more! A MUST for fan of this film or collector of JENNIFER CONNELLY! 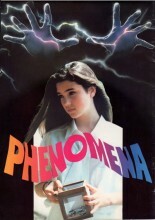 Click the button below to add the PHENOMENA JAPAN Movie Program JENNIFER CONNELLY to your wish list.